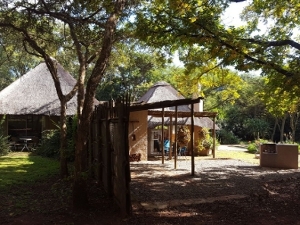 Zvakanaka offers accommodation near Louis Trichardt for those seeking a romantic getaway for two, a delightful family cottage for four and four secluded camp sites. The farm is a perfect stop-over for Beit Bridge. Zvakanaka farm is 74 hectares in area and the three main vegetation types are grassland, wetland and semi-deciduous scrub-forest. There are numerous trails cut on the farm and, depending on how much energy you want to exert, you can either take gentle strolls or more serious walks to the very top of the mountain where there are stunning views in all directions. The bird-life on the farm is plentiful and varied – the cliffs, grasslands, forest and the wetland ensure a wide range of species. Many of our guests express their delight in the chorus of bird calls during their time on the farm – particularly at dusk and dawn. that’s the feel that we’d like to impart to our guests. Zvakanaka farm is perfectly situated, both for people wanting an easily accessible destination for a tranquil escape, or for those who need a base from which to explore the richly diverse surroundings. If you want to visit the fascinating and beautiful Mapungubwe, say, but would rather overnight on the cool slopes of the Soutpansberg, then you can easily take a day drive – the trip to the park takes approximately two hours via Musina. There are three types of accommodation available on the farm : Igababa Cabin, Madala’s Cottage and Zvakanaka Camp Site. One of the bedrooms at the house has a WiFi HotSpot. This bedroom has its own entrance so there’s no need for us to be here to use it. It is uncapped and free. Both the cabin and cottage are strictly no-smoking zones and we ask that, if you are smokers, that you smoke outside as the smell of cigarette smoke clings to the thatch and stays forever. If you really do not think you can comply with this request we would ask that you rather not book with us. Please also kindly note that NO PETS of any sort are allowed on our farm. The approximate travelling times to us from some main points are: Polokwane (formerly Pietersburg) 1 ¼ hours; Pretoria 4 ½ hours; Johannesburg 5hours; Punda Maria Gate (Kruger National Park) 2 ¼ hours; Pafuri Gate (Kruger National Park) 2 ¾ hours; Beit Bridge Border 1 hour. Zvakanaka is located in a summer rainfall region, where the average annual rainfall is between 500mm to 800mm, with approximate summer temperatures ranging from a minimum of 12 degrees Celsuis to a maximum of 35 degrees Celsuis and winter temperatures ranging from a minimum of 5 degrees Celsuis and a maximum of 20 degrees Celsuis. There are a few days of frost during winter in the low-lying parts of the farm. 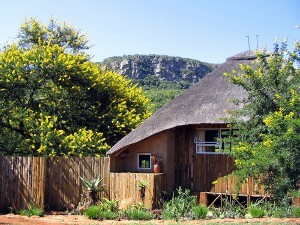 Zvakanaka farm is located on the south-facing slopes of the eastern Soutpansberg in Limpopo Province. To get there travel north along the N1 for approximately 11km from Makhado (formerly Louis Trichardt). 1km after the Avoca Vale Hotel, is a turn-off to the right to Witvlag. This is a gravel road. About 700m along this road, on the left-hand side, is the entrance to the farm. Peaceful, beautiful and fantastic customer service. I had a wonderful time, the place is ideal when you want to get away from the city life. Will definitely be going back soon. This has to be the most awesome place to go for a romantic getaway. We spent 4 lovely lazy days in Igababa Cabin. The cabin has a lovely rustic ambiance but has everything you will need, Indoor/outdoor shower, outdoor double bath, plunge pool, braai area with fire pit and a deck with fantastic views of the mountain. We were en route to Zim and needed a place to rest, giving us an early start to make Beitbridge early. Gail dealt with our reservation swiftly and at a very reasonable rate too! There are hot showers and plenty of firewood to use. We’ll certainly be using this site again on any further trips up to Zim. Thanks Gail! Me and my wife have had 2 perfect overnights at Zvakanaka Fram. Igababa Cabin end of October 2016, on our way to Kruger NP. The property is peaceful, the cabin is beautiful, and the owners are warm and friendly, so this place is an absolute gem! The cabin has all the comfort one would ask for, very private position, great trails to be hiked, and oh so many birds around it. Driving to the town is quick and easy. It’s the place to stay if you’re so lucky to travel in that part of the world. This is the best place to stay in Limpopo if you are on the way to North Kruger or Zimbabwe. But it deserves a week on its own to explore the Soutpansberge and Venda. The hosts Gail and Al will make you feel at home. We have been at both cabins before and we will return again and again!! This place is really a piece of heaven on earth!! If you love nature and silence… this is the place for you. Gail (the owner) is also always friendly and eager to assist!! We would say that this place is something for the bucket list. Wonderful place. Zvakanaka is really worth the visit. Beautiful, quiet and peaceful. Owners so friendly and accommodating. Lovely view. The mist upon our arrival was a bonus. Madala House had everything we needed. The personal touches like fresh flowers, Amarula and chocolate such a surprise. We’ll be back. Igababa Cabin is an absolute gem. Very private and intimate with 5 star attention to detail. Thank you so much Al and Gail for sharing this jewel with us. Three nights was simply too short. 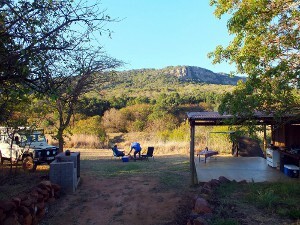 On our way to a two week camping trip in Zim we camped at the lovely Zvakanaka – what an awesome experience. Gail and Al welcome you with open arms. They also showered us with advice for Zim camping sites, the border crossing and hot spots for birds 🙂 The Zvakanaka campsites are amazing!! Lots of space, a covered area with a kettle (what a lovely surprise) and the toilet and shower facilities are really impeccable. There is even a washing machine! To wake up in the mountains, filled with sounds of birds and trees, feeling safe, and in such beauty is truly rare. A real must!! Romantiese wegbreek! Gail en Alistair maak voorwaar 100% seker dat jou verblyf net ‘n plesier is. Die kothuis is baie goed toegerus, veral die kombuis. Die uitsig is ongelooflik en die buitebad hemels. Hier kom kuier ons definitief weer en sommer gou! Dear Gail and Alistair. The same as my daughter said in 2012 (Aug) – WOW!! This is the best place to be for a weekend away and to start a New Year! Only the sound of birds.You created a lovely place, everything from the splash pool, the outdoors bath, the shower (I love it!) and the deck overlooking the mountain. We walked on every path, explored the bush, watching birds, rested and rested.We will surely come again and tell everybody about Igababa. Hierdie naaweek was die beste!! Baie dankie. Dear Gail and Alistar, thank you for sharing your little piece of heaven with us. We had such an unforgettable and special time in and around this wonderful cottage! It really was the perfect end to our 3 week holiday…next time we’ll add another day just to watch the birds perform around the bird bath. The cottage is truly what dreams are made of, not to mention the ‘rock shower’, ‘outside bath’, ‘view from the deck’ and the ‘braai area’!! We had a wonderful time.